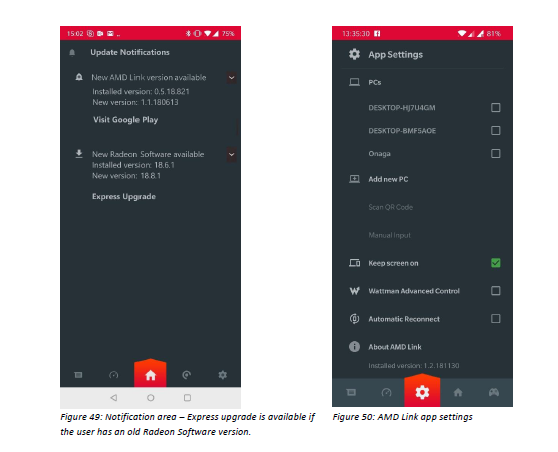 To setup AMD Link, simply install AMD Link on your smartphone or tablet and upgrade to Radeon Software 2019 or above. 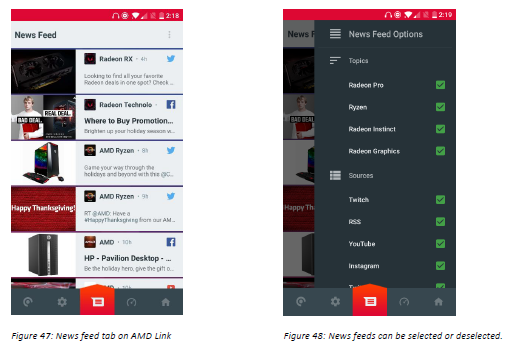 The AMD Link tab will now be visible at the bottom of AMD Radeon™ Settings. Enable AMD Link Server to connect your device to Radeon™ Settings. The first time you do this, a Windows Firewall prompt will appear to allow Radeon™ Software to communicate with AMD Link – make sure you allow it. 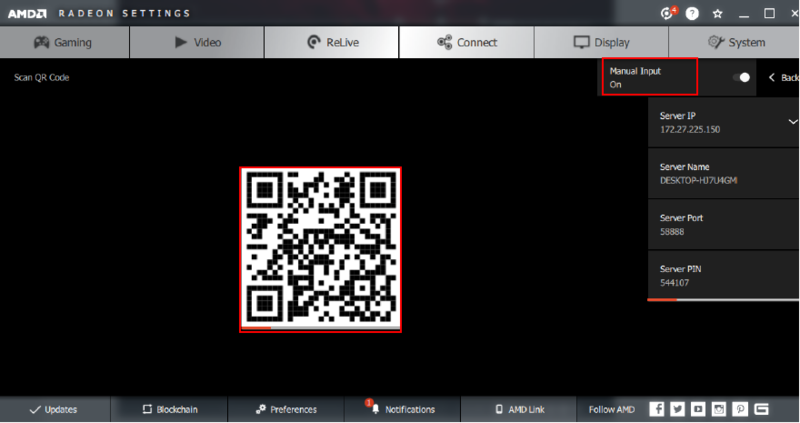 Then, you will be presented with a QR code – go through the AMD Link wizard and point your device’s camera to the QR code to connect. You will also be able to get connected through manual input. For security purposes, the QR code and server pin will update every few seconds. Figure 2: If for some reason authentication via QR Code isn’t possible, a manual input mode is also available. After connecting your PC to your phone or tablet, you can always remove a device by simply clicking on the device and selecting remove. You will also be able to add additional devices here so that Radeon™ Software can be controlled by multiple devices. If for some reason there is not a firewall prompt when you first enable AMD Link server, Windows Firewall may block AMD Link from connecting. If this occurs, you can have Radeon™ Settings try to auto-configure your Firewall by using the appropriate option shown here. 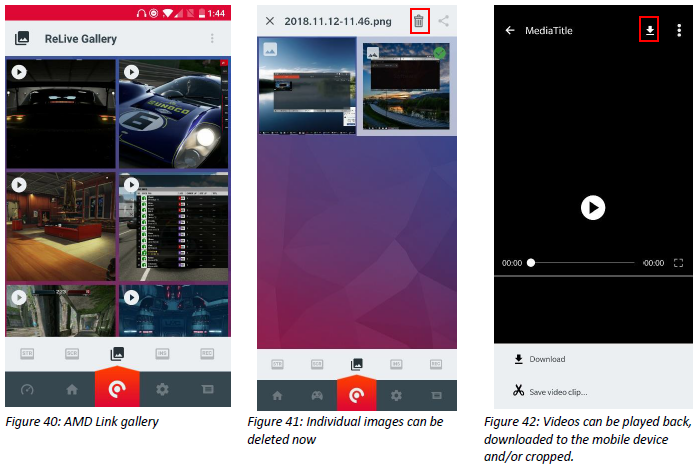 When opening AMD Link on your smartphone or tablet, you will be presented with the Add a PC button at the bottom of your device. If you have previously connected to your PC, your saved profiles will appear, allowing you to reconnect easily. Alternatively, setup can be skipped and a PC profile can be created later, through the “Add a PC” options in the Settings. 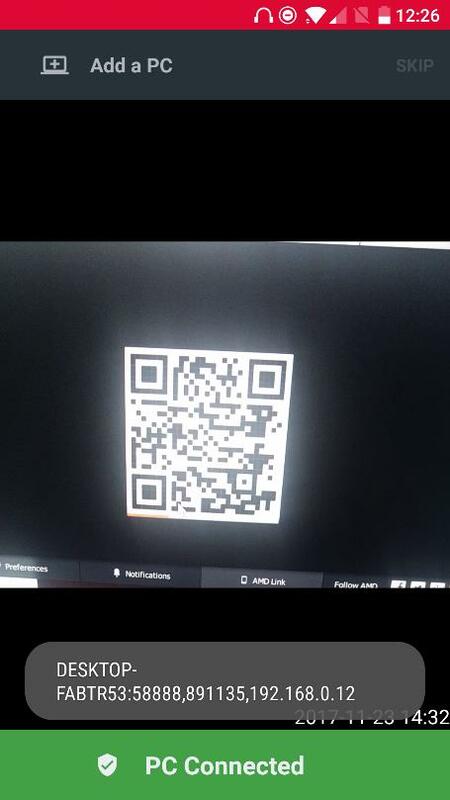 After tapping Add a PC, you can connect by scanning a QR code or through manual input. When connected, you will get a PC Connected notification. This connection will save to both your PC and your phone or tablet. 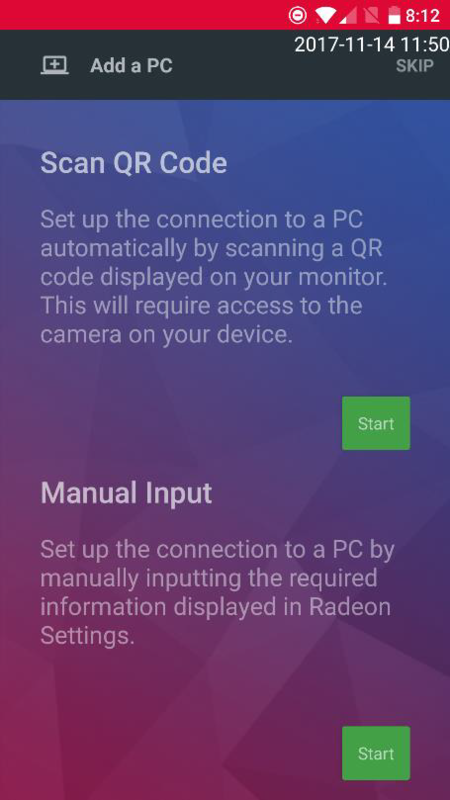 If you ever disconnect from Radeon™ Settings, simply go to the app settings button in AMD Link and choose the PC you want to connect to under PCs. Or simply reconnect from the Welcome page. Game Explorer is the default tab where the user can find their installed games. 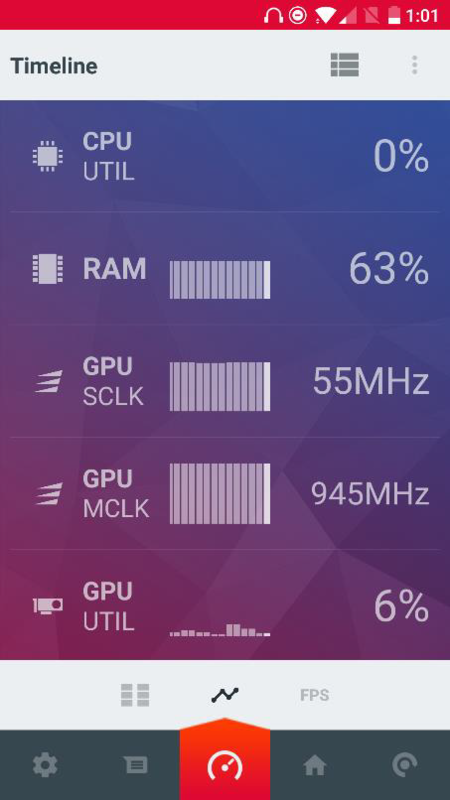 The app reads the game list that Radeon™ Settings already has and displays it. 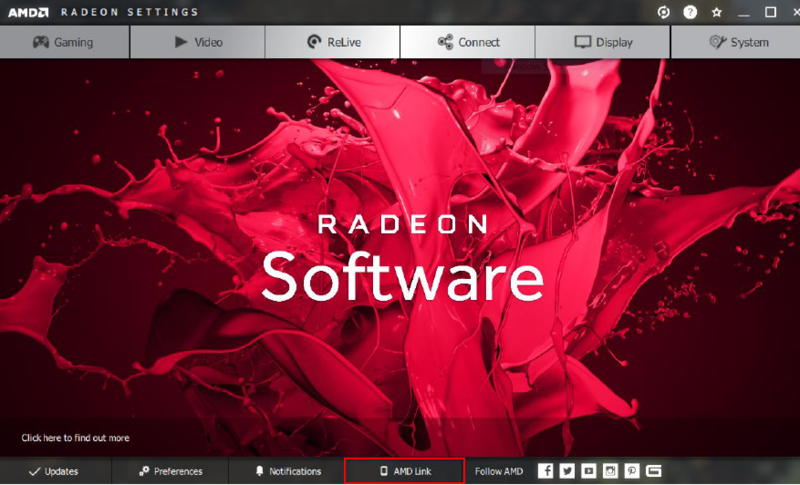 If there’s a game that is installed, but not indicated in this list, the user can add it though Radeon™ Settings – after that, the game will appear in AMD Link as well. An 802.11ac wireless network is recommended for use to help minimize latency and maximize performance. 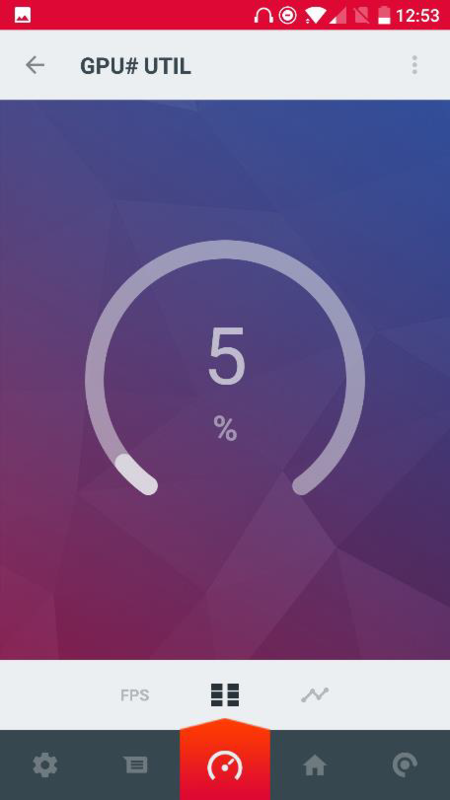 Game Streaming has various settings which allow the user to customize their streaming quality, accessible via the three-dot settings button. There is also an option there to test the stream and see whether the options that have selected are compatible for their system, or if adjustments are needed for best performance or quality. The user also can turn off their PC displays while streaming to their mobile device – which will allow total immersion to their game. You can also mute your PC sound so that the sound will only come from your mobile device. When the streaming stops, the PC display will automatically power on. The controller tab displays the current controller configurations; you can add one by tapping on the + symbol. Configurations can be based on the standard controller template that’s included, or the user can create something custom. By tapping and holding anywhere on the screen, you can add buttons and move them around; and by tapping and holding an existing on-screen button, the user is able to resize, or delete it. Located on the top right-hand side of the screen, there are options to alter the opacity of the buttons, make changes to the physical button mapping (if you have a controller connected), and the ability to save the profile and set default profiles. To play a game, simply click on the title you want to play from your list of installed games – it will launch on your PC and you will be able to see it on your mobile device (and your PC monitor, if you have that option). AMD Link is able to use any Bluetooth controller you have connected to your mobile device – that will be the default control method once the game launches. If there is no external Bluetooth controller, the default mode will be “Trackpad mode”, where you can use the mobile device’s screen as a trackpad. If more than one monitor exists, the monitor icon allows the user to stream the contents of the secondary monitors. The focus icon allows the user to stream only the contents of the active window – something especially useful if the game is running in Windowed mode. The controller icon allows to switch the controls from trackpad mode (which is the default) to your preferred controller mode. The three-dot menu allows for several of the options we described earlier to be changed while in- game, and thus allow the user to optimize their stream to their system. Figure 17: Tap on the three-dot menu to get to the streaming settings. To stop your stream, swipe down from the top, tap on the “back” button, and then click on the ‘Stop Streaming’ button on the top. If instead you want to go back to your game stream, click on the “Streaming…” bar to resume your original stream. Figure 18: If streaming is currently active, you have the ability to go back to the current stream. This is very useful if the user wants to work, or even watch a movie from their PC while capturing streaming content. AMD Link has introduced a new capability that allows the user to issue voice commands for the first time, making controlling your PC even easier. In order to do that, the user needs to long press and hold on the bottom navigational bar until the voice recognition screen is loaded. Supported languages are English and Chinese (Cantonese and Mandarin). Utilization” – the voice recognition software will recognize the keywords GPU Utilization, giving the appropriate answer. 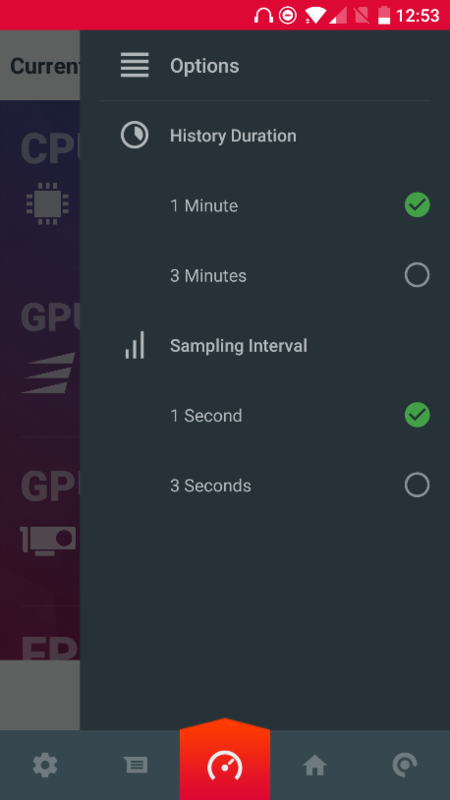 The performance & monitoring section allows users to monitor and track their Radeon™ PC gaming performance in order to better optimize their gameplay experience. 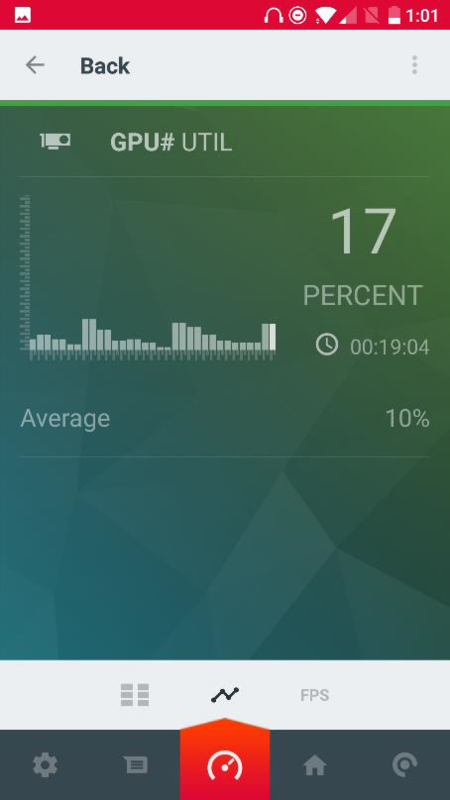 The default performance monitor screen displays current performance. Here you will be able to select the metrics you would like to track such as CPU, RAM, GPU, and VRAM utilization. While in-game, you will also be able to track Frames Per Second. You will also be able to select the performance monitor’s tracking duration and the sampling interval. Each of these metrics are clickable for a larger view. For a deeper dive into any given metric, the timeline screen allows users to track a specific metric over a period of time. Here you will be presented a timeline which tracks both instantaneous readings as well as an average. For the first time, AMD Link offers AMD Radeon™ Wattman* support. 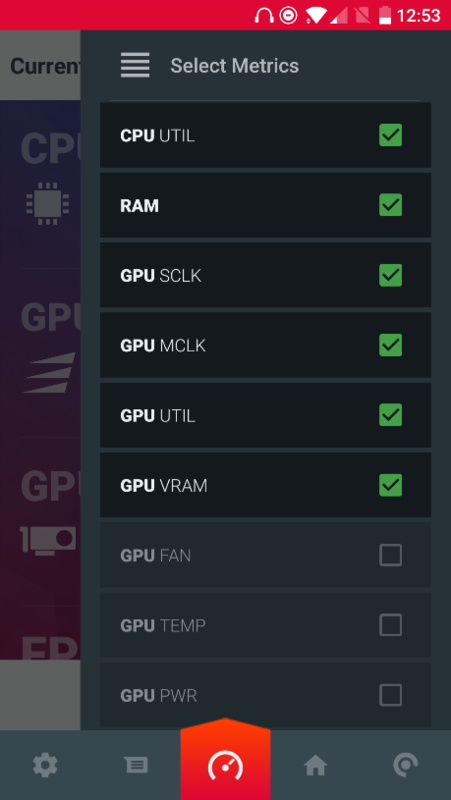 By default, you are only able to see information about your GPU and load a profile. 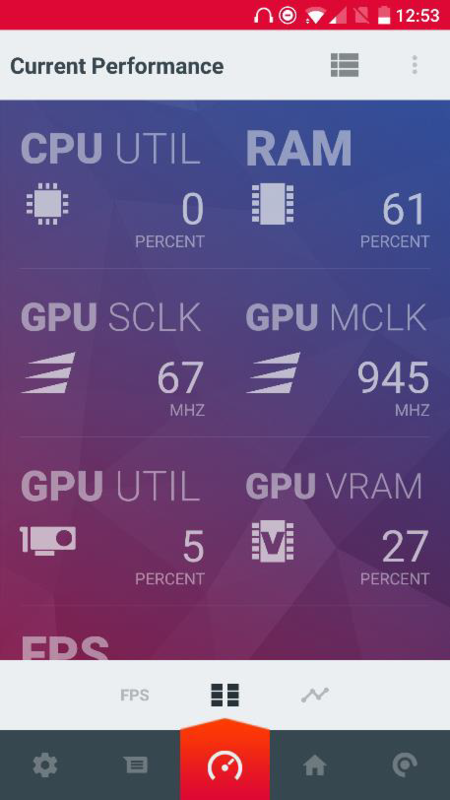 If the user wants to be able to customize their GPU, they need to enable the “Wattman Advanced Control” from the App Settings. Once that is done, you can overclock* their card and have a multitude of tuning options at your disposal. While playing a game in full screen mode, the current FPS screen gives a detailed overview of your gaming performance. Tracking your average FPS, minimum FPS, and maximum FPS, will allow a user to tweak their gameplay settings to better their gaming experience. As an added benefit, the background will adapt based on your FPS, with a red screen at <30 FPS, orange screen between 30-60 FPS and a green screen at >60FPS, to indicate performance levels. Additionally, there is a Capture Mode. 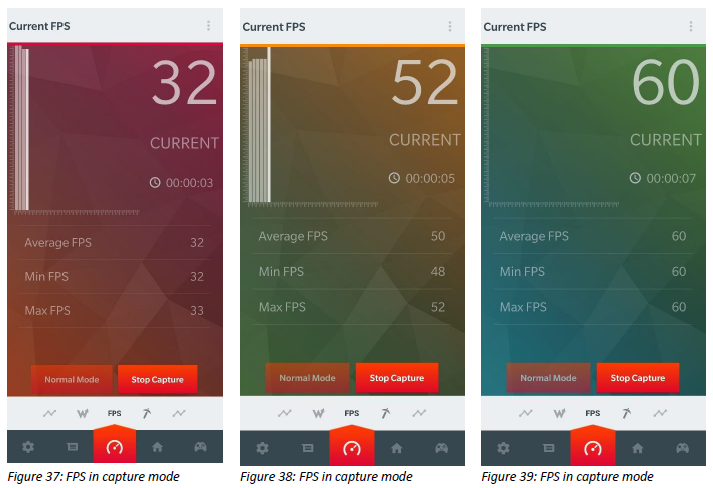 In this mode, the user is able to manually start/stop measuring their FPS performance, and allow them to monitor or benchmark a particular scene in their game, which will give them min/max/average fps. 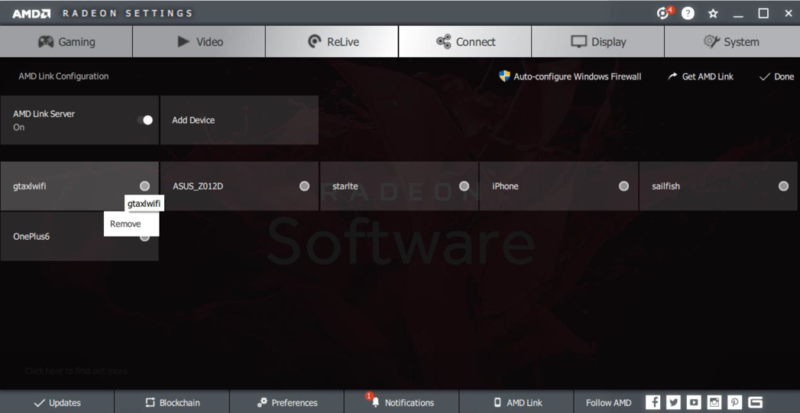 Users can control AMD Radeon™ ReLive on their PC with a smartphone or tablet. This enables one- touch capture, streaming and instant replay features, and an easy-to-use gallery feature where users can conveniently share screenshots through their social media accounts. 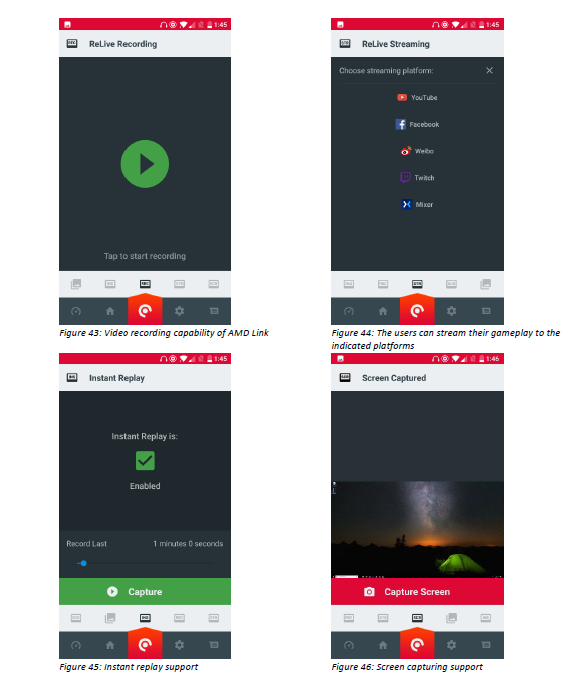 image allows you to preview its contents, whether it’s a video or a game screenshot. As far as videos are concerned, you can also crop it and save it to your mobile device. By pressing the three-dot icon on the top right corner, the gallery allows you to easily sort through your media. The top left icon on every file indicates if the file is a video or image. By long pressing each file, you are then able to share your video or image to your social media, or delete the file from your gallery. Gamers can also use AMD Link as a remote control for AMD Radeon™ ReLive. With built-in PC recording, streaming, instant replay and screenshot controls, you can easily capture, share and stream your favorite gaming moments. The News Feed option allows gamers to keep up-to-date on all the latest AMD news. Users can receive info about AMD products, AMD social feeds, as well as options to share opinions, tips and feedback across various AMD social channels. The Notifications button allows you to receive the latest and greatest updates related to AMD Link, including real-time notifications each time a new driver is released. If a new Radeon Software release is available, you will be able to do an Express Upgrade to your PC. App Settings allows you to reconnect to a PC, or add an additional PC., There are additional settings available to keep your mobile device screen on, enable the Advanced Wattman* settings and enable the new automatic reconnect feature – this will try to reconnect to the last known profile if the connection is lost for some reason. ZENFONE 6 launch date and phone leaked!